Ready to get outside and play some baseball? You’ll need some cheap baseball cleats if you want to spend more time on the field and less time worrying about work. Lucky for you, we’ve assembled a top-notch list of great baseball cleats that don’t break the bank. If you’re a first-time shopper, you may want to check out our specification icons so you’ll always know what to look for in a great pair of cleats. Spikes: The number of spikes you’ll need can change based on the type of turf and the type of game you want to play. Be sure to check out which numbers of spikes you’ll need before making a choice based on this spec. Spike Material: The material of the spike also makes a difference based on how you want to play. Metal cleats offer much better traction but are not allowed by some baseball administrative associations. Check out your team's rules first. Age Group: If you’re buying these for yourself or your child, you’ll want to check the age range offered by those specific cleats. This is a matter of personal needs, so just check for whichever one you’re shopping for. Weight: When playing sports, speed is key. If your feet are weighed down, you’re weighed down. Check out this spec to find a lightweight shoe to keep you moving at top speed. Material: The material can also be a personal preference. Some synthetic materials offer more durability during the game, while textiles can be more breathable, giving your nose a better after game experience. 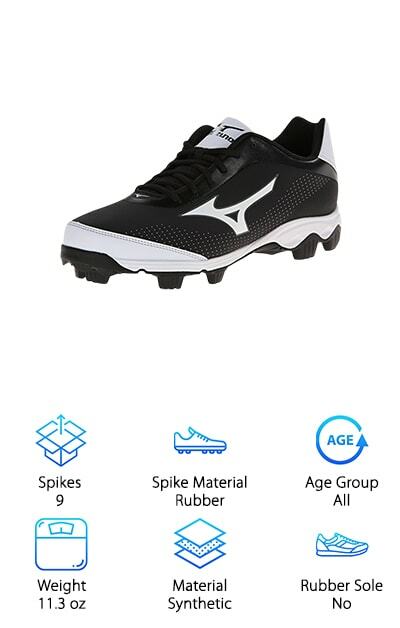 Rubber Sole: Many cleats with rubber soles offer molded spikes, which are widely accepted among most baseball associations. Some, however, do have metal spikes. Rubber soles offer increased flexibility during gameplay. So now that you know what to look for in a baseball cleat review, let’s get to shopping! We’ve assembled our handy guide with ten great picks for you. Our top pick and our budget pick are great places to start, as they’re the best of the best in our eyes. If neither of those catches your eye, never fear! We have eight other great options for you. So, let’s get out there and play the great game! 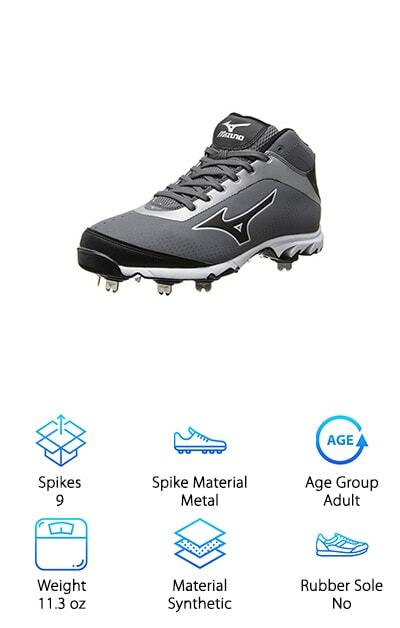 Our top pick for some of the best youth baseball cleats are these great ones by Mizuno. These cleats come complete with a 9 spike advanced outsole that allows you to achieve superior traction and comfort. The padded tongue makes it incredibly comfortable for long games. It also makes the cleats more comfortable and easier to take off and put on. These cleats have a full-length midsole that provides maximum comfort. The rubber stud provides durability and is great for all field types. So no matter where your game is, you’ll always have the best traction and speed on the field. These cleats are designed to be the optimal fit and feel for baseball. Mizuno is a great brand you can trust, with over 100 years of experience making sports equipment. These cleats are a great choice for anyone looking for a superior air of baseball cleats made by one of the best sporting goods brands in the business. Our budget pick is a great choice if you’re looking for cheap boys baseball cleats. 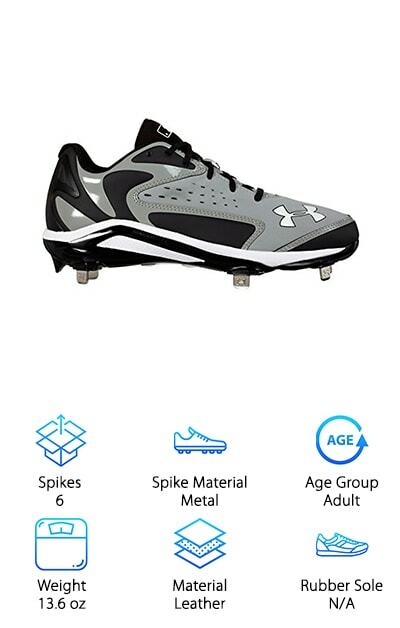 These Under Armour cleats come with a synthetic rubber outside, which is great for standing up to the dirt of a game. They have a rubber sole. The synthetic leather upper makes it incredibly comfortable to walk, run, and play in. It also makes these cleats durable and able to support your weary feet after a long game. The mesh tongue allows your feet to breathe easily, reducing the inevitable gross after game smell. This is because it helps keep your feet cool and dry all game long. The full-length EVA midsole adds comfort and cushioning. It also helps to disperse cleat pressure, so no one part of your feet is doing the heavy lifting. These rubber molded cleats are great for providing optimal traction and durability for all field surfaces, so no matter where you play you can play your best. These cleats are great for anyone looking for great youth cleats that can fit a variety of ages and sizes. They come in both little kid & big kid sizes. The little kid's cleats can fit most children from 4-8 years old. The big kids sizing is optimal for kids anywhere from 8 to 12 years old. They are made of a combination of textile and synthetic materials. They come complete with a rubber sole, for ideal traction on the field. These rubber molded cleats come in five colors to suit every team and style. They come in the classic New Balance black, a black and white with camo interior, a retro red and white mesh, a blue and white mesh, and black and white mesh. 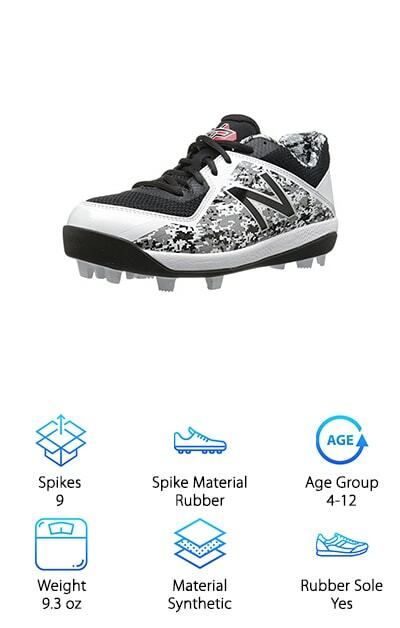 These options ensure that your child will love these cleats as much as you love the price. They’re a great option for anyone looking to buy some great cleats at a great price. If you're on the hunt for some great men's Nike metal baseball cleats, these may be the ones for you. These are a great choice for anyone looking for metal cleats that really allow you to perform at your best on the field. They come in three colors, black and white, blue, and all black. These nylon cleats are great for breathability. They offer side support, which lets you perform at your best. They are soft and lightweight, allowing you to focus on the game, not on your cleats. These metal cleats are great for baseball. Metal cleats allow you to get the grip you need to speed up and slow down. The metal spikes allow you to punch into hard dirt and grass, they are great for harder fields. They are great for anyone looking to play a serious game. 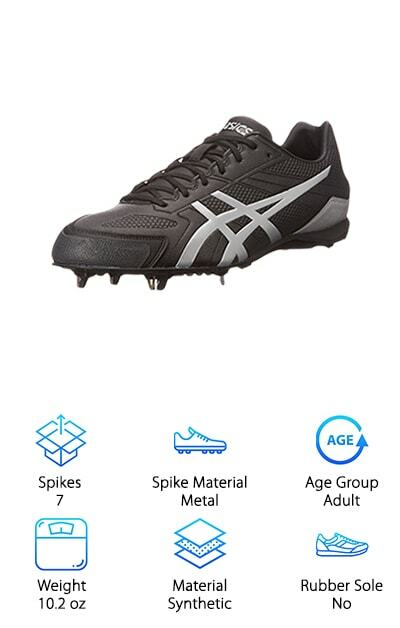 They offer you ideal playing capability, with the best metal spike cleats to help you really grip into the turf. Looking for some awesome metal cleats that can really help you be on your A game? 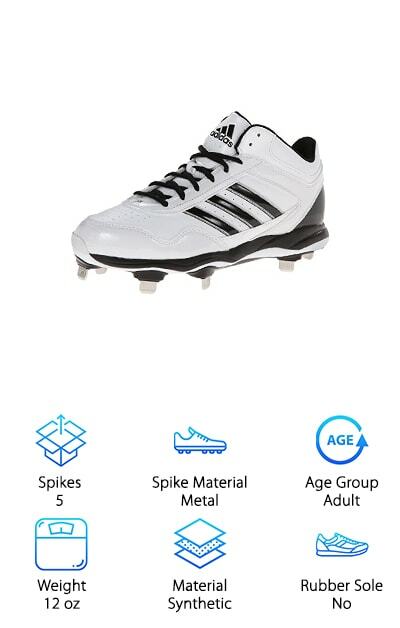 These Adidas Excelsior Baseball Cleats are great mid-cut baseball cleats complete with metal spikes. They offer full-length compression molded ethylene vinyl acetate midsole, which gives you ideal cushioning and comfort, all game long. The protrax metal cleat configuration provides you with excellent linear and rotational traction on grass and dirt surfaces of all kinds, making these cleats ideal for baseball and beyond. The ortholite sock liner is an added bonus, providing cushion and odor resistance. So even when you’ve played your best, you won’t smell like it. The outside is made of synthetic leather and nubuck material, which gives you great support and fit. These cleats come in four colors to match any style or team. The colors are black stripes on white, metallic silver, red and white, and white stripes on black. These cleats are a great choice for anyone looking for a great pair. If you’re in the market for some good looking expensive baseball cleats, the Mizuno Men's Vapor Elite cleats may be for you. These spiffy cleats come in five colors that are sure to wow on the field. The colors are black and purple, grey and black, navy and white, black and white, and black and red. Not only do these cleats look good, they’re sure to perform well on the field. These cleats come with an original nine spike configuration, giving you superior traction and control on the field. It has a padded tongue for superior comfort from start to finish. The full-length midsole also provides great comfort, so you're never worried about your feet hurting from your cleats. The pro flex grooves allow the front of your feet to flex fully and provide you with the best game you can play. These cleats are optimal for baseball and they’re a great choice for anyone looking to play. These cleats are great for anyone looking for something with some extra protection around the toes. The Pguard toe protector included in these cleats provides some extra toe durability, just in case someone accidentally tramples you during the game. These cleats come with a Pebax spike plate that optimizes flexibility while maximizing durability. The seven spikes on the bottom are great for conquering the baseball field. They allow you to grip the field in the most important places and optimize your playing capabilities. The compression molded EVA heel wedge provides some extra cushion, so you’ll stay comfortable all game long. These upper on this cleat is made of a synthetic material for ultimate comfort and fit. 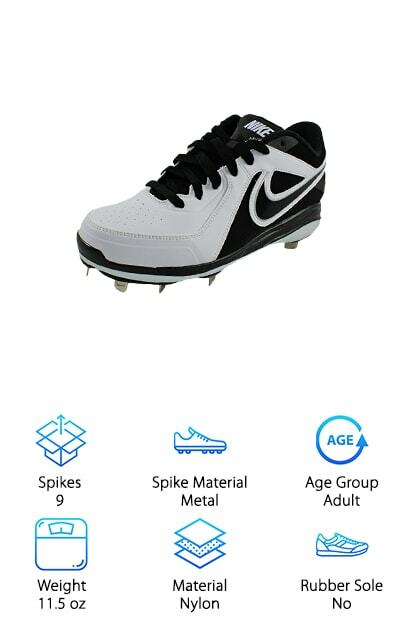 This is a great shoe for any baseball player looking for a lightweight cleat and spikes with a great fit. These cleats are the ideal choice for people looking for a great seven spike cleat as well. On the hunt for the best molded baseball cleats? Look no further than these awesome New Balances. These cleats come in the classic New Balance style, in both black and white. They are made of textile and synthetic materials, making them very breathable and easy to wear. These cleats have a rubber sole. They also come complete with fifteen spikes on the bottom for ideal traction and performance on the field. They have a rubber sole with molded spikes that are great for any game. The Revlite midsole is perfect for ensuring you’re comfortable all game long. These features make it easier to focus on playing the game, not being in pain from your cleats. These cleats also come with toe protection, just in case someone is really in a hurry to grab that base. The comfort collar on top of the cleats make sure that you’re comfortable, no matter how long the game goes. 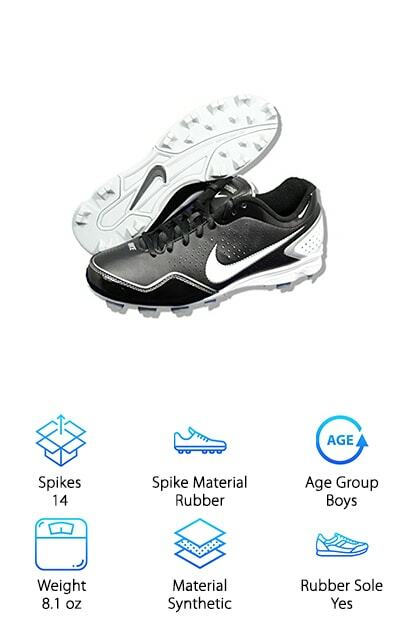 If you’re looking for youth cleats made by one of the best baseball cleat brands, these Nike Keystone Baseball Cleats are the ones for you. These cleats offer a durable and lightweight synthetic leather upper. This makes it easier for you to focus on the game and not on your cleats. Synthetic leather is highly flexible while remaining strong and durable. The midsole is crafted from a new design. It’s a full-length Phylon midsole, which offers you great support and comfort during a game. The outsole is 3-color solid rubber. This makes it durable and ready for any kind of game. These cleats are bi-level. The supportive ¾ height of this shoe makes it ideal for all turf conditions you could encounter while playing softball of baseball. These cleats come in a great black and white design that looks great. This simple design also allows it to easily blend with any uniform or team colors. 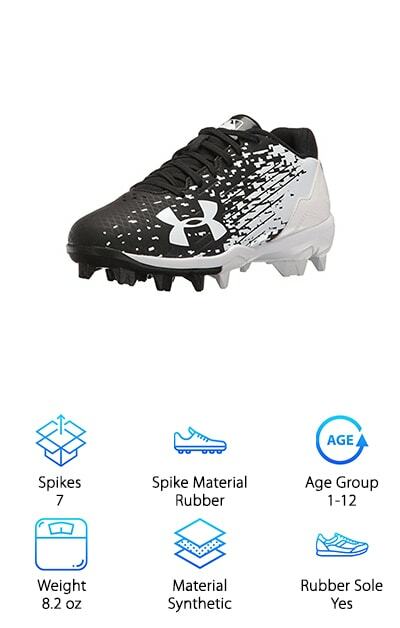 These cleats are a great choice for anyone looking for something by Under Armour. These men’s cleats come in two attractive colors- all black and a grey-black combo. They are made of nubuck leather, making them a great combination of durable and flexible. This allows you to move your feet as easily as possible during the game. The perforated patent leather upper gives ideal breathability, so your feet aren’t struggling during a long game. This is also great for your nose after the game! The foot-forming 4D foam inside the shoe molds to the foot for a great fit, no matter the feet. The abrasion-resistant toe piece ensures that your cleats don't get ripped up during a great play. This also reduces toe drag. The outsole offers medial and lateral support to your feet for optimal stability. The rotational traction cleat technology optimizes rotational capability to allow you to play your best game.